Resistance to fire and termites. Strength - They combine very strong concrete and use quality Australian made reinforcing wire. Durability and Longevity – This is the result of resistance and strength. Driveable - pre-stressing (the same process as in making driveable concrete bridge pylons) gives these prestressed concrete posts the strength to enable mechanical driving. Availability - production on a daily basis ensures a reliable supply. These prestressed concrete posts have been used throughout NSW and QLD. They have been sold to customers as far away as Innisfail (Nth Qld), Longreach, Dalby, Condobolin, Goulburn, Bega and north from the Hunter Valley to the Queensland border. 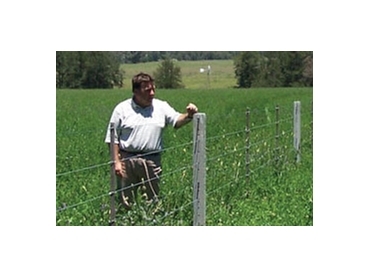 Derek Field, from Widden Thoroughbred Stud, in Widden Valley says, "We have erected over 5 kilometres of fence using SCI pre-stressed 7' (2130mm) intermediate concrete posts plus 8' strainers and stays to fence off creeks and areas where termites have previously caused havoc with timer fences. “We haven't had any problem with either brood mares or cattle in the paddocks where we've built these fences and we expect to use more in the future."